A popular small growing maple Acer palmatum ‘Atropurpureum’ has the added attraction of seemingly ever changing foliage. The five lobbed leaves appear as a nice crimson color in spring, turning to deep crimson and green in summer before putting on a display of brilliant crimson in the autumn. Useful as a landscaping tree, a feature tree in a small garden or a small shade tree. 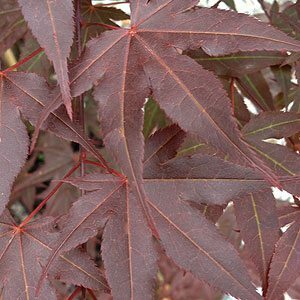 Reasonably slow growing Acer palmatum ‘Atropurpureum’ will reach a height of 3 – 4 metres with a similar spread. Sold as bare rooted plants in winter and potted specimens all year round. Full sun with some protection from hot drying winds. A humus rich soil is best, in areas of clay soil improve the soil before planting, or consider building up the bed to ensure good drainage. New plants are best staked and watered in well with a liquid seaweed solution to encourage root growth. Mulch well and water through the first summers and then when conditions are dry. Little other care is needed, damaged branches can be pruned back however do other pruning is generally required as Acer palmatum ‘Atropurpureum’ naturally creates a nice shape. Acer palmatum atropurpureum – Summary Information. Spread – Will form a crown or around 3 metres over time. Foliage – Deep purple turning to red and then a scarlet red in autumn. Position – Protected from very hot afternoon sun and strong drying winds. Container use – Yes suited to growing in containers.